When you're unemployed and depressed what you need is some upbeat glamorous pop with a vaguely seedy edge to perk you up. Maybe one of the creators needs to have some sort of creepy '70s moustache. 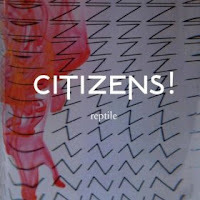 Seemingly formed from the ashes of Official Secrets Act, Citizens! fall between the dance grooves of Friendly Fires and the pop scale of Franz Ferdinand (Alex Kapranos produces here) with elements of their former incarnation thrown in for good measure. In other words they are exactly what you're after in a pop band right now. 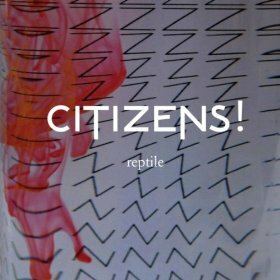 'Reptile' appeared online a fair while ago but is released today as a digital single with a bucket-load of remixes, none of which I've got around to listening to. I'm sure they're good enough if that's yr kind of thing, but frankly I'm far too wrapped up in this slice of brilliance. 'Reptile' even manages to bring to mind the early 90's material of Pulp in it's gleeful use to keyboards to promote it's rubbery bassline. Watch the dancing of frontman Thom in the video and try to pretend you don't feel like doing the same when you play this track. You won't be able to match his moves though. As a bonus, you can download the equally ace 'Girlfriend' from Citizens! website for FREE.